Review: This could be the anthem you are looking for. Here is the official Alan Dixon remix of Frank Bookers Gospel Anthem Rise and Shine that will tie any room together like Lebowskis carpet. 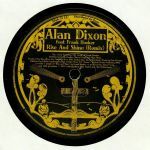 The flip side has Alan Dixon s house stomper What Cha Gonna Do feat Meleke and a remix by Chief Lumberjack Marcel Vogel. Positive vibes all around.